POMEGRANATE MARTINIS - To Your Health! 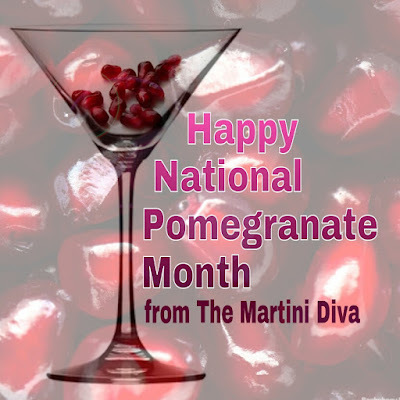 Here in the U.S. pomegranates are in season and fresh, seasonal fruit is a great way to make a great martini as well as boost your health. There's no reason happy hour can't be happy and healthy at the same time. "Moderate drinkers tend to have better health and live longer than those who are either abstainers or heavy drinkers. In addition to having fewer heart attacks and strokes, moderate consumers of alcoholic beverages (beer, wine and distilled spirits or liquor) are generally less likely to suffer strokes, diabetes, arthritis, enlarged prostate, dementia (including Alzheimer's disease), and several major cancers." Adding a fresh, healthy and seasonal fruit like pomegranate juice as a mixer just ups the healthy ante. The pomegranate is mentioned in Europe as early as the Iron-Age Greek Mythology in the Homeric hymns. Native to the Iranian Plateau and the Himalayas in Northern India, the pomegranate is now cultivated throughout the world. It was introduced to North America when Spanish settlers brought it over in 1769 to California. Here in the Northern Hemisphere it is in season from September through February which makes it a wonderful fresh, winter fruit for making martinis! The name "pomegranate" derives from the Latin word "pōmum" which means "apple" and "grānātus" whic translates as "seeded" In Germany it is called a Granatapfel or "Garnet" apple and in France it's called "pomme-grenade" while the early English version was "apple of Grenada". 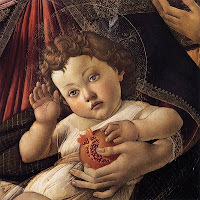 There are some who say that it was not an apple which Eve used to tempt Adam in the Garden of Eden but a pomegranate! Lowers blood pressure - a study showed that drinking 1.7 ounces of pomegranate juice per day lowered systolic blood pressure by as much as 5 percent. Reduces the risk of heart disease - drinking pomegranate juice daily may help support the normal blood flow to the heart. Fights Cancer - pomegranates have high levels of the flavenoids, antioxidants that are thought to be effective in counteracting various cancer-causing radicals. In one study drinking 8 ounces of pomegranate juice per day kept PSA levels stable, reducing the need for further treatment such as chemotherapy or hormone therapy. Another study in Israel postulated that pomegranate juice destroyed breast cancer cells while leaving healthy cells alone. It may also prevent breast cancer cells from forming. Pomegranates might reduce the risk of atherosclerosis, osteoarthritis, and diabetes. Pomegranates might reduce the possibility of developing Alzheimer's. Drinking pomegranate juice might even be a natural way to prevent dental plaque. The seeds of the pomegranate are where all this goodness resides but it can sometimes be difficult and messy to remove them from the outer hull. To easily remove those morsels of tasty goodness cut your pomegranate in sections then hold that section seed side down over a bowl and hit the rind of the pomegranate with something hard like the back of a spoon - the seeds will pop out easily from a ripened fruit!